As demand for all-wool shoes grows, a number of US footwear brands are heading directly to the source: the sheep pastures of New Zealand with a population of 4.6 million people and 29.5 million sheep, New Zealand has roughly six sheep for every person. And now, the wooly beasts are helping drive a new movement: farm-to-foot. Apparel companies are already taking note. Swiss brand Baabuk now sells wool sneakers; following a recent successful Kickstarter campaign for $170,000, the brand will launch its first US e-commerce site later this year. London-based Mahabis, which sells to American customers online, makes a wool slipper that transforms into an outdoor shoe with a detachable rubber heel. Head of content and partnerships at Mahabis, Alice Apsey, said the clever design has brought the company £10m ($13.1m) in revenue in two years. Perhaps the most iconic wool footwear brand to date is Ugg, a US company with Australian roots, whose boots feature an exterior layer of sheepskin and a woolen interior. The boots became popular in Australia in 1970s, particularly with surfers, who loved the fact that they could warm their feet instantly after coming out of the ocean. Back in those days, you could buy a pair of boots at a petrol station for $12. Now, Ugg has become a luxury brand. The boots sell for around $160 all over the US. Capitalizing on consumers’ newfound love of wool footwear, two companies are now taking things a step further, working directly with sheep farmers in New Zealand to source high quality wool for a range of shoes – for both winter and summer. San Francisco-based Allbirds is redesigning the sneaker: a fine merino wool upper and base made from castor bean oil, a natural substitute for plastic and rubber. The shoe is washable and unbranded. Established by former New Zealand soccer player Tim Brown and renewable materials expert Joey Zwillinger, the company wants to create a classic shoe that’s sustainable as well as stylish and durable. Having seen his fair share of branded sneakers as a professional athlete, Brown wanted to eliminate the logos, produce a minimalistic design but still have a high-performance shoe. As a New Zealander, wool seemed like an ideal option given the surplus of material around him. So he applied for a grant from the New Zealand wool industry to determine what kind of wool would be best for a sneaker. The first prototype was made with “mid-micron” wool, which is thicker and harder to work with. Brown then transitioned to a super-fine merino fabric with a 12.5 micron diameter, much thinner and lighter than the mid-micron – the kind that is predominantly used in making fine wool suits. “From prototype to current version, we ran countless tests to get the quality to where we balanced strength, softness and all of the other great qualities you get with merino, such as temperature regulation and wicking,” says Zwillinger. Wool acts as an insulator, making the shoe warm in winter and breathable in the summer. Plus, it controls odor naturally – wool fibers neutralize body odors thanks to their composition of fatty acids, which have antibacterial properties and can absorb 35% of their own weight. Simply put, wool can soak up sweat and the odor that comes with it. Allbirds raised $119,000 in a Kickstarter campaign, and later raised more than $2m in venture capital funding. In March, the brand launched its washing machine-friendly wool sneaker via an online store. The shoe sold out in two months. Today, the company works with a mill in northern Italy, which turns the New Zealand wool into fabric. The shoes are then assembled in South Korea. 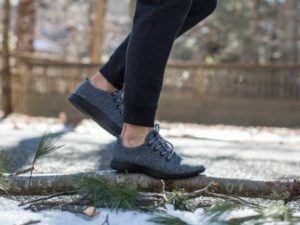 A pair of Allbirds retails for $95 online, a price comparable to popular athletic brands such as Nike and Adidas. Allbirds declined to reveal how many shoes it makes or sells per year, but it did confirm its biggest market is in the US. 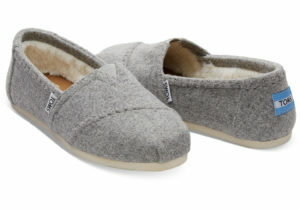 While Allbirds is working with fine merino wool, Danish brand Glerups works with felted wool – also sourced from New Zealand farmers. Glerups is known for its calfskin and wool booties and slip-ons. Thick, cozy and durable, the shoes are made of a single piece of felted wool that is stitched onto a calfskin base. The brand is launching in the US later this year. Speaking from the Outdoor Retail show in Salt Lake City, Allan Timm, co-owner and director of Glerups, says that the shoes will be available at retailers such LL Bean, GarnetHill and REI this fall. They’re already available for sale on the National Geographic Store. Conceived by a Danish couple in the late 1970s, Glerups originally only worked only with Nordic farmers, procuring wool from Gotland sheep, a breed native to southern Sweden. Nanny Glerup could sew only two shoes a day, and her husband, Ove, liked to maintain personal relations with all the farmers. Nanny’s shoes slowly became popular in Copenhagen’s shops. However, the company ran into trouble as it tried to scale up its efforts in the 1990s. Timm, who had been working with El Naturalista, a footwear brand in Spain, was inspired by the couple’s devotion to their homespun enterprise. Using his global contacts, he built up the Glerups supply chain and, in 2005, the company relocated production from Scandinavia to Romania to reduce costs and ramp up production. They began producing 20,000 pairs a year, selling predominantly at fairs and brick and mortar stores in Denmark before eventually moving to an online store. Today, Glerups are sold in 14 countries around the world at the rate of around 200,000 pairs a year. Timm says the company has grown by 20-25% over the last few years. This increasing demand is what led him to look for an easier-to-procure wool. He bought a plane ticket and spent a few weeks traveling around New Zealand, speaking to wool farmers. “I was surprised to meet farmers who had been raising sheep for over 20 years but never got to see where the wool landed up,” he says. Graham Sinammon, for instance, has been shearing sheep for the past 15 years. Situated at Meringa Station in New Zealand, he and his wife Tracy have never seen what happens to their wool. “We’ve just loaded the wool on the truck and that’s the last feedback we’ve received pretty much, apart from how much it received at auction,” Sinammon says. Both Glerups and Allbirds now work in conjunction with a part commercial, part co-operative group called The New Zealand Merino Company (NZM), which connects international brands to wool farmers across New Zealand and helps establish contracts between farmers and brands to ensure a consistent supply of wool. “This way they know they have a guaranteed customer, and how much money they’ll get for it,” Timm says. “It creates some security for the farmers.” Recently, Timm brought the Sinammons a pair of Glerups to test out. “It’s really satisfying to see where [the wool] ended up,” Sinammon says. Brown, who grew up in New Zealand, says he’s happy to see a resurgence in the country’s wool industry. That said, the increased demand in wool footwear is unlikely to create a supply problem. Wool costs more – which is why big footwear manufacturers stick to synthetic materials. “I don’t see us running out of wool any time soon,” he says.